Beautiful pink and sparkle gold girl's 1st birthday outfit includes tutu, bodysuit, and hair bow. Baby girl's light pink and sparkle gold first birthday outfit includes pink and gold tutu, white bodysuit with sparkle gold "One" and pink heart, and optional hair bow headband to match. We can also make this outfit for a second birthday. Just select the birthday number in the drop down menu. Tutu is 6 inches in length. We will make the waistband size according to the bodysuit size selected. 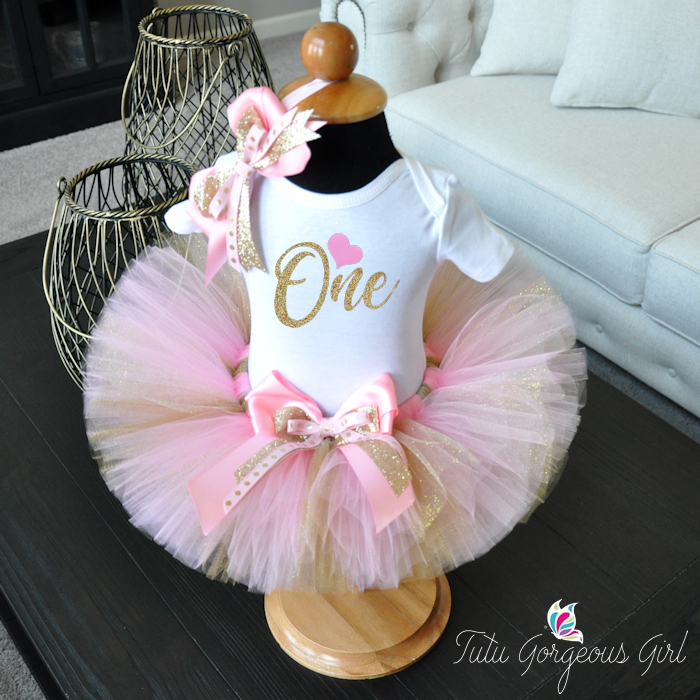 This tutu set ships via Priority Mail, and is made to order.